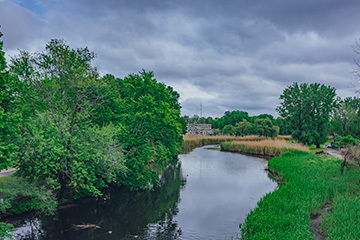 The Back Bay Fens is an urban park designed by Frederick Law Olmstead. The large picturesque park forms part of Boston's Emerald Necklace, and is home to many pieces of artwork and memorials. The Fens contains the elegant Kelleher Rose Garden and is near the Museum of Fine Arts.